If you’ve had an epic cake baking fail – don’t worry – let Paul Hollywood explain what went wrong and show you how to fix it so next time you bake the perfect cake. Come and explore the most common reasons for a cake baking fail. 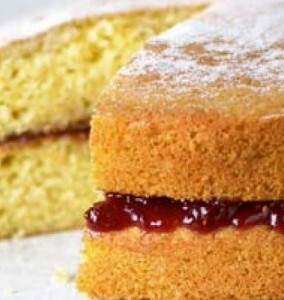 If your cake or has a badly cracked or peaked top you may have adding too much baking powder and/or bicarbonate of soda. You may also have overfilled the tin, or the cake may have cooked too quickly due to being too near the top of the oven or the oven being too hot. There are lots of reasons why the top of your cake may have sunk during baking. You may have used too much raising agent, over-creamed the fat and sugar, over-beaten the mixture after adding the egg, under-baked the cake or had the oven on too low a temperature. Another way to avoid cakes sinking is to never slam the oven door. If your cake is looking a bit too brown, it is probably because you have over-cooked it or the oven was too hot. You can always cover the top of the cake with tin foil if it is starting to look a little bit too brown. It could also be because there is too much sugar in the recipe. Likewise, if your cake isn’t brown enough it is likely because it is under-cooked or the recipe used insufficient egg or sugar. Make sure that you use a good quality tin and grease it well or your cake may stick to it, making it hard to remove. Don’t over grease it though as this can cause the cake to form a crusty ring around the sides. Speckling can occur on the top of the cake if you use too much sugar, or granulated sugar instead of caster sugar. You also need to sift the flour and sugar well to prevent this from happening. Often fruit will sink to the bottom of the cake. This can happen when the fruit is syrupy, or high in natural sugars. To avoid this, wash the fruit to get rid of the syrup, dry it well (if the fruit is wet, this can also cause it to sink!) and cover it in flour. Do not open the oven door too soon to check on the cake. • You need to get you mixture spot on for puddings. If it is too dry then your pudding will be dry and if the mixture is too wet, then your pudding could be heavy and soggy. Make sure that you completely cover the top of the pudding. • You also need to leave the pudding to stand for three to five minutes after you take it out of the oven otherwise it will break up when you turn it out. An under-greased pudding basin will cause the pudding to stick to it.